The Empty Chair: Rabbi Nachman said: The world has yet to taste what I have to offer. Were they to hear just one of my teachings together with its proper melody and dance, the incredible delight would bring everyone to a state of sheer ecstacy and total transcendence of self. 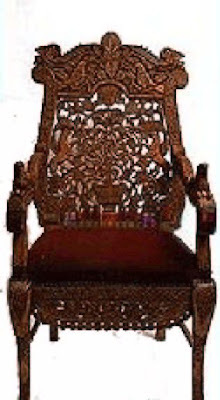 This exquisitely hand-crafted chair ... belonged to Rebbe Nachman. Tradition has it that it was agift given to the Rebbe by a follower in 1808. The man, a simple laborer, had worked on it a few hours every day for six months. During the Cossack uprisings against the Jews of the Ukraine in the early 1920s, the chair was dismantled for safekeeping. In 1936, a family of Breslover Hasidim escaping Europe ahead of the Holocaust brought it to Jerusalem. There, it was reassembled and refurbished by the Israel Museum in 1959, and later restored by Katriel's of Jerusalem. Listen to the Kabbalistic tales of Rabbi Nachman of Bratslav. Learn about his life and legacy. Understand why – 200 years after his death – Rabbi Nachman still has legions of followers who worship at his grave, sing his praises … and tell his Tales.